A proposed legal settlement would require no-spray buffer zones for several pesticides along the West Coast, but critics question its enforceability. A proposed legal settlement between environmentalists and federal regulators would restrict pesticide usage near waterways, but critics say it's uncertain how the deal would be enforced. The U.S. Environmental Protection Agency has proposed a "stipulated injunction" that would require no-spray buffer zones around streams in Oregon, Washington and California for five pesticides. The buffers would extend 300 feet for aerial applications and 60 feet for ground applications of carbaryl, chlorpyrifos, diazinon, malathion and methomyl. 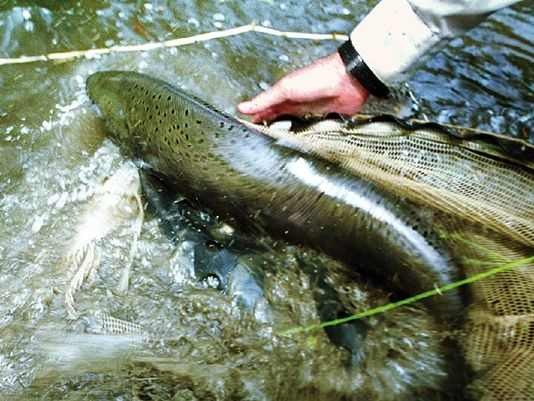 EPA says the buffer zones are intended to protect endangered and threatened salmon and steelhead in rivers and streams along the West Coast, but pesticide proponents say there's no proof the chemicals harm fish. "It's totally inappropriate," said Heather Hansen, executive director of Washington Friends of Farms and Forests, an agricultural industry group. The deal would resolve litigation between the EPA and several environmental groups, but the buffers "would not be enforceable as labeling requirements" under the Federal Insecticide, Fungicide and Rodenticide Act, according to an agency notice. "Since failure to comply with the buffers in the proposed stipulated injunction would not be considered a violation of FIFRA, compliance would not be enforced by the EPA," the agency said in an email to Capital Press. The buffers would be "subject to the same judicial oversight as any other court order," the agency said, adding that it will be providing more information to growers. Since the buffer zones aren't required by FIFRA, it's "very, very unclear" who would ensure the restrictions are followed, Hansen said. "This is an example of what happens when you have regulations being made through 'sue-and-settle' rather than science-based policy making," said Scott Dahlman, executive director of the Oregonians for Food and Shelter agricultural industry group. The proposed deal undermines the EPA's longstanding assertion that the "label is the law" in regard to pesticide usage, Dahlman said. The settlement appears to operate in a legal gray area in which public policy is dictated by court orders, he said. "It's messy." The buffer zones have the potential to be disruptive to farmers, since some of those pesticides are the most effective tools against spotted wing drosophila, a fruit pest new to the region, he said. Growers will not have to worry about the enforcement issue if they simply abide by the court-ordered buffer zones, said Stephen Mashuda, an attorney with the Earthjustice law firm, which negotiated the deal. However, Mashuda acknowledged the specifics of any enforcement action are unknown until a farmer is accused of violating the order. "The settlement doesn't really address the enforcement angle," he said. Mashuda said that, as far as he knew, such violations were not a problem when a similar court order was in place for the pesticides between 2004 and 2009. "There wasn't widespread non-compliance," he said. The court-ordered buffer zones would effectively nullify any pesticide label language that contradicts the new requirements, Mashuda said. "Those labels are no longer in effect," he said. Dahlman of Oregonians for Food and Shelter said he disagrees with that interpretation, but said it's too early to explain the impact to growers. "I don't know how it plays out," he said. The settlement deal between EPA and the environmentalists doesn't have the power to modify pesticide label language, Dahlman said. "An actual label change has to go through the EPA process," he said. "A court can't just do that." The EPA did not respond to a request for comment about the enforcement issue as of press time.